The other day I was involved in a dental case with the most wonderful, beautiful black lab. She was admitted for a COHAT (Comprehensive Oral health Assessment and Treatment). These owners attended Rau Animal Hospital’s Client Focused Educational Seminar on the subject of dentistry before they even purchased this dog as a puppy. This gave them all of the tools to provide exemplary care for their pet’s mouth. These owners brush the teeth daily and this pet eagerly participates in the process. On the annual physical exam, it was noted that there was a mild amount of tartar on the surfaces of the upper fourth premolars and the upper molars. There also was a history of persistent halitosis despite their elegant home care. Having attended the seminar, they understood the benefits of a professional cleaning and assessment. When the veterinarian recommended the procedure, they accepted the recommendation valuing the advantages of early detection and the opportunity for the shortest possible anesthetic experience. 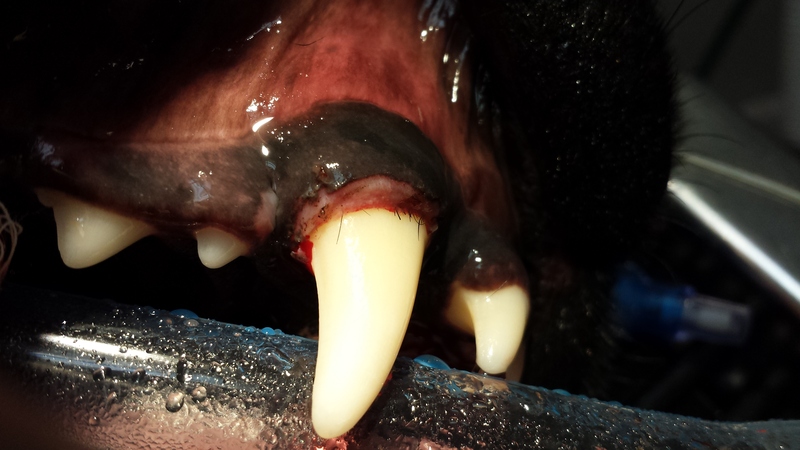 When charting the mouth, we noted that this 5 year old Labrador Retriever had some localized gingival hyperplasia. Gingival hyperplasia is an over abundance of gingival (gum) tissue. Normal sulcus depth on a large dog should be less than 4 mm. This pet had depths measuring 7-8 mm associated with the canine teeth, and 5 mm with the upper lateral incisors and the upper first molars. By using the dental explorer we were able to determine that this was a case of hyperplasia instead of a periodontal pocket. The explorer revealed the smooth enamel surface under this tissue, not the rough surface of exposed cementum experienced with a periodontal pocket. Gum tissue will never adhere to enamel, only to cementum. This over growth creates a “pseudo” pocket; an area where food and debris can be trapped consequently jeopardizing the health of the supporting structures of the affected teeth. A phone call was placed to the owner and we discussed the unexpected finding. We suggested a minor surgical procedure called a gingivectomy. A gingivectomy is a procedure performed to return the sulcus depth to its normal depth by surgically removing the excess gum tissue. The owner complied and the procedure was performed without complication. What I wanted to show you all is what was found under the gingival tissue despite a thorough dental cleaning and polishing. If you look carefully, you can see all of the embedded hair that was stuck under the tissue. Left untreated this hair would have remained undetected and it would have continued to be the nidus for infection and the subsequent persistent halitosis. Now that the procedure has been done, any hair that gets caught in the gum tissue will be easily removed by the exquisite tooth brushing that this dedicated and loving gentleman provides for his buddy. *If any of this information was useful or you would like to see similar content, “LIKE” the Pet ED Veterinary Education and Training Resources Facebook page and sign up on our website for our newsletter.